Ten foolproof steps to taming the world's most beloved vine. Whether you’re planting new grapevines or have inherited an overgrown “grapezilla” that you’ve vowed to tackle, it’s important to prune them in winter while they are fully dormant. It’s easier to see the structure of the plant without all the leaves in the way, but more importantly, the potential for infection is minimized if you make your cuts this time of year. Once you understand a few basic principles, the annual chore of grape pruning is a simple, straightforward affair. Websites and books full of terminology like the “two cane umbrella Kniffen system” or “head-trained, spur-pruned vines” obscure that fact that all grapes respond well to a single basic pruning approach, which can be modified depending on the type of trellis used or the specific goals of an advanced grower. Here’s the secret: grapevines produce fruit on one-year old wood. What the heck does that mean? When a bud sprouts in spring and grows into a new shoot within the larger grape plant, the shoot turns from green to brown by the end of the growing season, at which point it is considered one-year old wood. The following spring some of the buds on one-year-old wood will grow flowers (which develop into fruit), while the buds on older wood produce only leaves or shoots. The primary goal of pruning is to maximize the amount of one-year old wood on each grapevine without encouraging the plant to produce so many grape clusters that it lacks the energy and nutrients to fully ripen them. Left to its own devices, a grapevine grows to a dense mass of mostly older wood with relatively little “fruiting wood” each year. The dense growth leads to poor air circulation, which encourages fungal diseases. Expect to remove 70 to 90 percent of the previous year’s growth each winter. Expect to remove 70 to 90 percent of the previous year’s growth each winter. 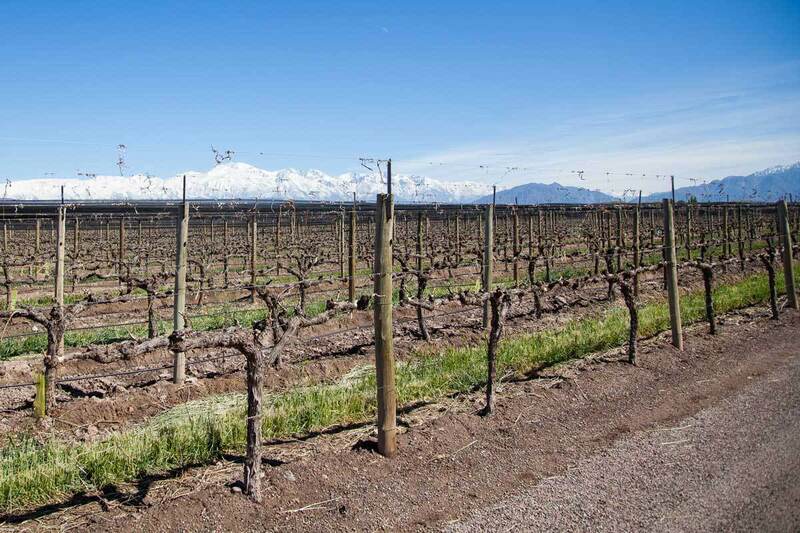 The second purpose for pruning grapes is to encourage the vines to grow a structure that is conducive to harvesting and which conforms to the shape of the trellis the vine is growing on. Aim to create an orderly system of evenly spaced vines that resembles the branches of a tree. There are many trellis options, but most vineyards utilize a system of one main trunk with two or four main branches that angle off at 90 degrees along heavy-duty wires positioned a few feet above the ground. Each winter, excess vine growth is cut back to the main trunk and branches to preserve the structure. 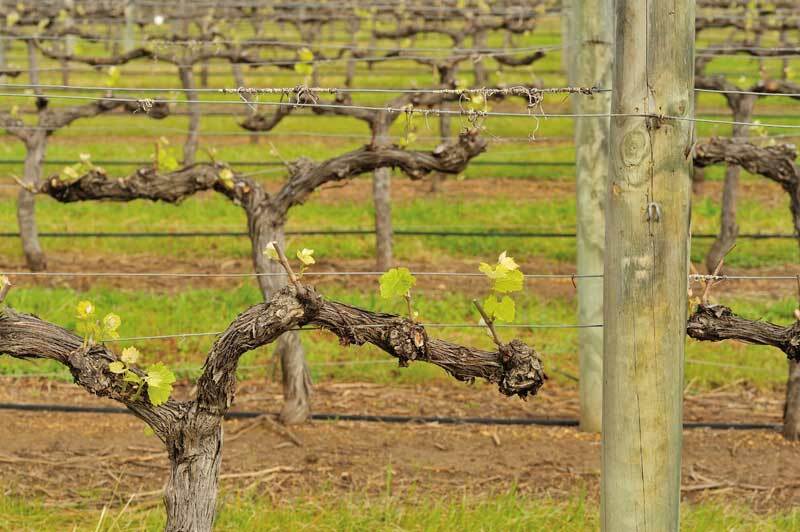 Grapevines are capable of growing to enormous proportions, however, and there is virtually no limit to the size or type of trellis and the number of branches that can be established. The following instructions presume you’re starting with the 2 -to 3-foot bare root vines that nurseries typically sell in winter. If your vines have already been growing for a few years, or if you’re tackling a massive overgrown grapevine, you’ll need to cut it back to conform to the shape of the trellis (so that it resembles the form outlined in steps 1 through 6 below), before proceeding with an annual pruning regime. If that sounds next to impossible given the current shape of your vine, there is no harm in cutting the entire plant back to within 2 or 3 feet of the ground – it will regrow vigorously the following year, allowing you to begin the training process anew. Loppers and a small pruning saw are necessary to rework large overgrown vines, but otherwise a pair of hand pruners are all that’s needed for annual pruning. 1. If there is more than one shoot on the plant, select the most vigorous and cut the others back flush to the main trunk. 2. Cut the selected shoot back to two or three buds above where it started growing the previous spring from the main trunk. This encourages strong growth the coming spring. 3. As the main shoot grows during the coming year, tie it to the trellis using green vinyl plant tape. Remove any other shoots as they appear during the growing season. 4. The following winter, cut the main shoot back to a few inches below the first horizontal support of the trellis. 5. In spring, several shoots should sprout from the buds below the cut that was made in winter – as they grow, tie one shoot to each trellis support (selecting for the most vigorous shoots) and remove the rest, cutting them flush with the main trunk. 6. Cut off any flower clusters as they appear to encourage the plant to devote its energy to vegetative growth. The plant will be ready to support fruit production starting in year three. 8. Cut the remaining shoots back to 6 or 8 inches in length. The fruit will develop on these short stubs. 9. Remove any shoots that grow from the main trunk or that sprout from the roots. 10. Continue the process of training new shoots along the all the trellis supports over the coming years. Each winter, cut off the ends of the shoots that have grown beyond the trellis support. Sterilize your pruning equipment after working on each vine by dipping the cutting blades in a solution of isopropyl alcohol. Promptly remove any diseased wood – it may have lesions or sap on the wood, with grapes that don’t ripen, mold, or discolored leaves – and burn it (if you’re in a rural area where that’s allowed) or toss it in the “green bin” for the municipality to haul it away. Any cuts that aren’t made flush to a trunk or branch should be made at a least one inch above a bud and at a roughly 45-degree angle (to allow water to roll off rather than catch in the pock mark that often develops where a branch has been cut). Tie the shoots loosely to the trellis with green plant tape – the tape will eventually decompose once the branch is stiff enough to support its own weight, but you don’t want the tape to constrict its growth in the meantime. Thanks the best and easiest to understand advice for pruning my truly over grown grapevines! Great step by step. I have the grapezilla scenario from vines that are over 100 years old (transplanted from the family home). Many fond memories of my grandmother making jelly, need to get the vines back to producing for her memory.